Now, more than ever, there are countless options for kids' desks, desk chairs, and storage pieces! We've found some top trends for desks in kids rooms this year - take a look at some of our favorite trends below. The Bellamy Collection by Smartstuff Kids Furniture boasts a vintage appeal with girly details and the desk doesn't disappoint! With a graceful Victorian elegance, the youthful journaling vanity desk provides an expansive surface for homework and getting ready for school. Three drawers to keep pencils out of sight feature intricate carving detail on the front while the curved apron and cabriole legs provide a simple yet eclectic look. Did we mention it's available in three finishes? Take your pick between french grey, daisy white, and antique rose! What little girl doesn't love crystal knobs? This desk from the Eleanor Collection by KidzGear is a great choice to wrangle that homework and get ready for school. Classy details including a decorative paneling design on the drawer fronts and carved legs add a feminine touch! With a classic look, the American Spirit Collection by Legacy Classic Kids offers a desk that's perfectly sized and functional for your star student. Three drawers to the side of the desk offer ample storage - plus, there's a keyboard drawer too! 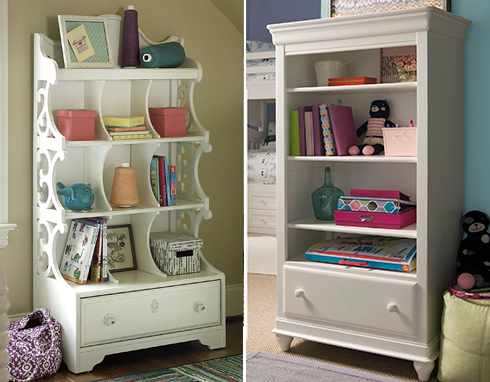 Traditional hardware handles and a classic cherry finish bring a sophisticated learning space to your child's room. You can't go wrong with a classic white desk! The Madison Collection by Legacy Classic Kids offers a writing desk in a natural white finish that offers the surface area your little one needs. Without large storage drawers, this desk's design helps to keep a small room feeling open and larger. Every child seems to acquire stuff! As parents, we love to store the stuff somewhere so storage is always a necessity. Start with hutches! Perfect for smaller rooms, this storage options adds to the top of your desk so it doesn't take extra floor space. Don't forget about bookcases! Whether you choose a traditional option or an updated version with some design details, bookcases are always functional for storing books and beyond. Feminine versions include curved panel designs and traditional options focus on straight lines and molding details. Shop all Kids Desks and furniture online and at our Kids Showroom. Conveniently located in Dulles, Virginia, Belfort Furniture offers hundreds of room settings for you to view and be inspired by! Need some design help? Fill out our online Design Help form with your design dilemma, likes, and inspiration for some personalized design suggestions!